Blowing Hot and Cold in Japan ! This is part 2 of my “Japan and I” Series. To read Part 1, Please click here. In many ways, Japan still remains a mystery to the rest of the world. For here, the ancient and the modern not only coexist but seem to do so in great harmony. The land of the rising Sun is as comfortable with its bullet trains and cutting edge technology as it is with Zen and Geishas.Japan has a unique culture, with its own peculiarities and quirks that seem natural to the Japanese but intrigue and surprise all foreigners. Through this series, I attempt to talk about the Japan I saw and experienced! Today we talk about the Japanese and their love for formal wear ! The first thing I do whenever I am about to visit Japan is stock up on my formal clothes! Formals are an accepted wear in any work environment across the globe but the Japanese take the formal wear fetish to new heights. Not only are they particular about being dressed in formals but also about the color. Every working person in japan or “Salary-Man” as they are called will be dressed in a conservative black or dark blue suit, tie and a sparkling white shirt all five days of the week. Yes, even on Fridays, when the rest of the world, a little saner in aspects of allowing people freedom, lets its employees come to work in informal clothes, Japan still sticks to full formal attire. I guess men don’t have much of a color choice any ways, but even the women stick to black and white or dull light colors. During the morning rush hours, the Japanese scuttling out of the train station reminded me irresistibly of penguins! Wearing formals is fine in winter, but in summer wearing a full suit in Japan can be sheer hell. From June to September, Japan gets extremely hot and humid and the severe jackets and tailored shirts just add to the discomfort. I used trains to commute to work and my office was a good 10 minutes’ of sweltering walk from the station. In spite of carrying my Jacket in my hand, I used to reach work all sweaty and already in need of another bath. To add to our woes, a few years back, the Japan Government in a crazy bid to conserve energy came up with the brainwave that the A/C in all offices will not be more than 28 degrees. At 28 degrees the cooling is non-existent and there is no concept of ceiling fans in japan. People resorted to buying small fans and clipping them on their desks but that did nothing but throw ineffectual gusts of air your way. So you slowly and steadily melted in the stifling heat as the day progressed. We foreigners muttered and complained darkly about this new regulation but the Japanese “salary-man” bravely soldiered on – while their crisp white shirts turned grey and sodden in the heat and their ties hung loosely and lifelessly around their neck. But they still wore their formals! The Japanese are nothing if not conformists! Then a few years back Ministry of environment decided to come out with the “Cool – Biz” Campaign. The formal wear was relaxed a bit in the summer. People were now allowed to wear short sleeved shirts and jacket and ties were not required from the months of June till September. Women could wear loose cotton tops and do without jackets as well. A special advisory was passed to wear starched collars so that they don’t become limp with sweat and also to wear light cotton shirts and trousers as this material was most comfortable in summer. This sent shock waves throughout the working world in Japan. Most of the Japanese, trained for years on wearing full formal clothes found the whole idea sacrilegious! I suppose coming to work without ties and jackets was for them equivalent to coming to work in shorts and Hawaiian shirts. For a logn time, most of them still came to work with their ties in their pockets and their jackets in their hands lest they were the odd ones out. But clothes retailers caught on fast and started manufacturing thin cotton clothes suitable only for the Cool Biz period. It’s now quiet common to go to department stores in Japan in the beginning of summer and see advertisements for “Cool Biz” attire. 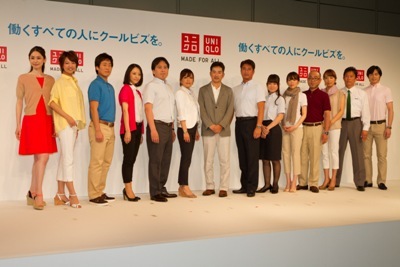 Japanese Clothes Retailer Uniqlo showcasing its "Cool Biz" range ! Japan still follows its rule of formals throughout the week but now the number of people coming to work tie less and wearing light colored trousers and half sleeved shirts in summer is slowly increasing. I suppose the Japanese “Salary-man” has finally given in to comfort over conformity! Glad you like them Ghata ! Welcome here Sundar. The Japanese surely are a mysterious race ! Wow, this was really interesting. Yes, Japan has the image of being stiff about a lot of cultural things. You must have hated the formality in attire. I remember being equally shocked when I saw people dressed casually, in unironed clothes and going to work in offices in California. Casual if fine but going to bedclothes is also cringeworthy :). I agree. Frankly I prefer to be well dressed at work. I am not as fussy as the Japanese but Unironed clothes at work would put me off completely ! You bet you would have to ! Thank you Shilpa. Glad you like the series. It's very well written. Felt like a real trip to Japan and having a closer look at their lives. Thank you for such a wonderful read. Welcome here Abhra and I am glad you like the write up. I wish our poor advocates and judges would receive similar 'orders' to dress down, Ruchira. Did you wear Indian attire to the office? Or was that frowned upon? Looking forward to part 3 in this series. I think our advocates get two months of summer vacations - That's not too bad is it :) Indian was frowned upon. They would be too polite to say anything to us but they would not like it ! True about the summer break, but Mumbai is humid all year through. Seriously, I feel many school uniforms too are hangovers from the British days and are best discarded for cooler outfits. Sad that Indian was frowned upon. My aunt who immigrated to Australia in the '60s wore a sari to work everyday and told us that they loved it. I hope things are better now. Heat and formals rarely go hand in hand. This is an interesting series Ruchira. Thank you Alka. Glad you like the series. Things are definitely better now ! They find it fascinating ! You must have heaved a big sigh of relief, Ruchira. I am hoping the 'penguins' did the same. I have spotted some looking at Qutub Minar in those starched white shirts and jackets that you speak about. And no, it was not 28 degrees but close to 48. I find the Japanese very endearing, but such conformism must be difficult to work with/around! Super post! Ohh they are not the easiest to deal with ! I love UniQlo store in NYC. Cool-Biz must be a big relief, considering the weather and temperature setting regulations there in summer. And the link to the first part is not working. I love Uniqlo too ! Cool Biz sure was a big relief. Thanks for pointing out about the link. Have corrected it ! Thank you Bhavika. I am glad you liked it. Welcome here ! They do remind me of penguins :) So happy you are liking this virtual tour ! Loved your earlier post of Japan about displaying food.found this post to be interesting. Seems that the Japs are a stickler for discipline but can't imagine being in full suits in the sweltering heat.Give us more insight of the Japs life-style. waiting for yr next part. Glad you like the series Kalpana. They are sticklers for discipline which is very good but sometimes they take things too far ! Interesting and I am so thankful that I dont work in Japan :) I can never wear those suits and tie. It is amazing to learn about another country's culture, Ruchira. Japan has always been fascinating - a friend of mine lived there for a few years and wrote me long emails describing everything. And now, I am delighted to read your posts - I can see this becoming a fantastic series and perhaps a book? :-) Do keep it in mind! Now that is a great idea ! How interesting Ruch...a window to another world. I was in Japan for a very short trip an year ago and didn't get the sort of insight you offer. Nice! So true Ruchira! When I visited Japan for work my formals also had a lot of color and they didnt know what to do with me. But they were polite as ever. :) Work apart Japanese women have awesome fashion sense and Ginza street is like a runway. Japan is known to be a disciplined country. Quite interesting. I've been watching a lot of Korean shows off late, and those are all adapted from Japanese Manga, now I understand why they wear all these dull colours and suits. Wonderful reading this, Ruchira! I hate wearing formals. It is like dressing up for a play. Although the post is very interesting, I pray to God that I am never reborn in Japan. Phew. Just thinking of the stifling heat makes me melt. good that the 'salary-man' in Japan is slowly having a change of heart as regards clothes. Age No Bar - 55 Fiction !